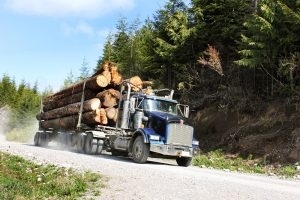 Oct. 26, 2018 – Thanks to FPInnovations’ Steep Slope Initiative researchers, there’s a new Android app available for mobile devices to help determine appropriate payloads and descent speeds for loaded log-hauling trucks travelling on slopes with curves, as well as on inclines greater than 18 per cent. The Steep Grade Descent (SGD) Guidelines app is based on a spreadsheet tool and allows users to input various road parameters such as grade, length, the presence of a switchback, and traction level. The app predicts safe loads and operating speeds for specific road conditions, also entered into the app. If the specified conditions pose too high a risk, then additional measures such as revised road parameters (grades and traction) must be considered to ensure safe hauling. The app is developed for highway trucks with 42 cm (16.5 inch) diameter brake drums with a payload of 60 tonnes. For a truck configuration to be acceptable, it must be able to stop on a steep pitch using only its service brakes in the event of a driveline failure. The SGD Guidelines app is available on the Google Play store and FPInnovations is working on an iOS version, which will be released in the upcoming year. For more information please contact Séamus Parker at Seamus.Parker@fpinnovations.ca.